This historic image of downtown Delaware will be projected on the exterior of Ohio Wesleyan University’s Richard M. Ross Art Museum as part of “The Shadows We Cast” outdoor exhibit by artists Tiffany Carbonneau and Susanna Crum. The exhibit will be open until Oct. 31. The newest exhibit at Ohio Wesleyan University’s Richard M. Ross Art Museum promises to provide viewers with an especially illuminating experience. 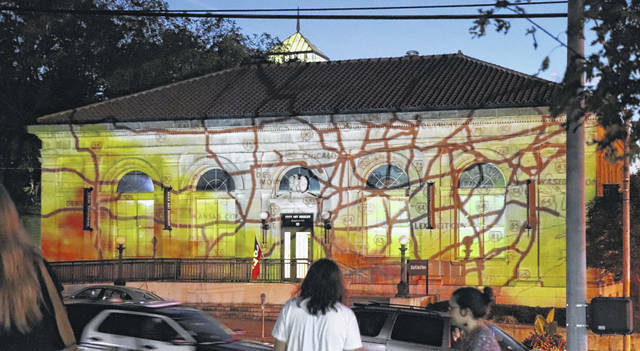 The exhibit, “The Shadows We Cast,” will feature an architectural-scale video projected nightly onto the front façade of the art museum, 60 S. Sandusky St., Delaware. The exhibit will be in place until Oct. 31. The exhibit will debut with an opening-night celebration at 7:15 p.m. Sept. 20 that includes an opportunity to hear from the artists who created the 12-minute video and archivists who will speak about the importance of preserving local history. Then at 8:15 p.m., guests will be invited to grab a cookie and a cup of hot chocolate or hot cider and go outside and watch the video play for the first time. In creating “The Shadows We Cast,” artists Tiffany Carbonneau and Susanna Crum used materials culled from the archives of the Delaware County Historical Society and the OWU Historical Collection. Carbonneau, M.F.A., is a video installation artist and assistant professor of art at Indiana University Southeast, and Crum, M.F.A., is a printmaker and interdisciplinary artist who conducts “research-based, site-specific projects that investigate the layers of history stored within public spaces.” Learn more about them at www.tiffanycarbonneau.com and www.susanna-crum.com, respectively. A highlight of the new video exhibit, Fletcher said, is the spirit of collaboration that made it possible. “It’s really wonderful how many people were willing to get on board with this exhibit when they understood that it told a story shared by Delaware and Ohio Wesleyan,” she said, ticking off a list that includes colleagues at Ohio Wesleyan and representatives from the Delaware County Historical Society, City of Delaware, and Main Street Delaware, which plans to include the outdoor exhibition in its Oct. 6 First Friday celebration. In addition to the outdoor exhibit, the Ross Art Museum’s current and upcoming indoor exhibitions include: Now through Oct. 8, the “Marty Kalb Retrospective,” featuring paintings that span the 50-year career of the retired Ohio Wesleyan fine arts professor, and, beginning Oct. 19, concurrent displays of photographs by Cleveland visual artist Charles J. “Chuck” Mintz and paintings by Ohio State University assistant art professor George Rush. During the academic year, Ohio Wesleyan’s Ross Art Museum is open Tuesday, Wednesday, and Friday from 10 a.m. to 5 p.m.; Thursday from 10 a.m. to 9 p.m.; and Sunday from 1 p.m. to 5 p.m. The museum is handicap-accessible and admission is always free. Call 740-368-3606 or visit www.owu.edu/ross for more information. Like the museum of Facebook at www.facebook.com/RossArtMuseum.